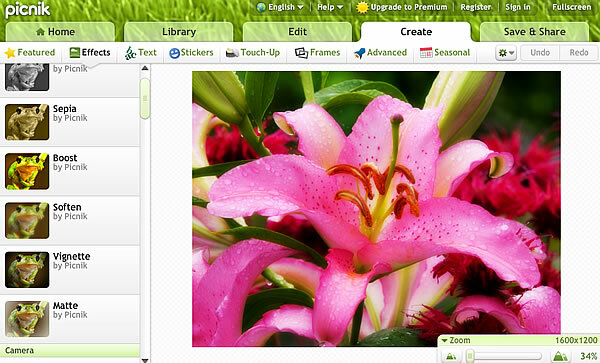 Picnik is a free online tool, that allows you to edit photo and images freely. Using Picnik photo editing is easy and fun to use Now let’s give a look how to edit photos and images by picnik software. 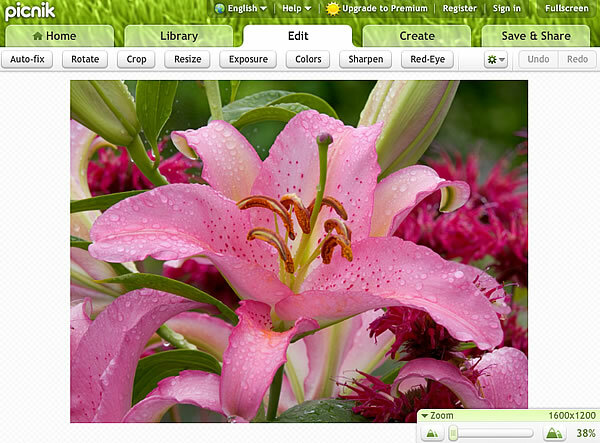 picnik home page and then clik on the big green button “Get Started Now”. Once clicked the button, the software will run in loading mode, picnik main page will appearÂ in few seconds. In the left side of the page, will appear a new button. Just click again on the button called Upload a Photo, and than browse through your files and select the file to upload. 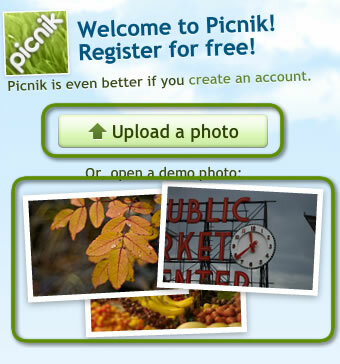 If you don’t want to use your personal photos, but you simply desire to try picnik effects, you can open a demo photo choosing it amongÂ the three ones you can see under the green button. The Photo will be loaded in few seconds, and placed in the main working area of picnik as shown Below. Crop: This tool literally cuts unwanted edges of a photo, choosing and saving only a particular area. Resize: Your photo is too big ? Nevermind, this tool will resize your Photo in seconds. Exposure: Correct Exposure and Contrast of the photo using the sliders. Colors: This effect has two main option, the first one is auto-color that corrects automatically the colors of your photo, or just use the slides to correct them manually. Red-Eye: This is a very useful tool, tired about photos with ugly red eye effect? Well, fix it using this tool! You can also remove Red-Eye effect in Pet’s Eyes. All the effects you have seen in this video can be found in picnik Edit Menu. Now let’s give a look to the effects that can be found in Create Menu. Effects: The Main Category that includes all color effects, filters, etc. Text: Add Text to your Photo, chosing colors, font, size etc. Stickers: Choose a Sticker and stick it on your photo. Seasonal: this catecory includes special effects and filters relating to different events or holidays such as New Year Eve, Holiday, Thanksgiving, Halloween and much more. If you want to have all picnik features ready to use, you can download picnik addons and plug in, specifically designed for your Browser. These Addons and Plugins add a new item to “right click menu” to send automatically a picture found on the web directly to picnik. Addons and Plug-ins are designed for the Following Browsers: Firefox, Explorer, Chrome. Just Click Below to download them. So, I hope this post will be usefull to you, and don’t forget to share it with your friends on Facebook, Twitter and Google+ ! This entry was posted in Picnik Photo Editing. Bookmark the permalink. i dont know how to..i so wanted to try..